Barn owls, a majestic icon of the British countryside, are dying off in their thousands. 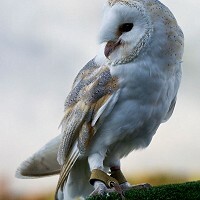 A changing climate and habitat loss is part of the picture, but Britain's barn owls are also being killed by powerful rat poisons being used on farms across the country. Owl Ring Bearer Goes A Little Wrong: An owl from Turbary Woods was used as a ring bearer at a wedding, things didn't go quite as planned as he decided to sit in the rafters after dive bombing the bride. Out In The Wild: With Easter coming up there are some fabulous days out for all the family. This is a half page item that is appearing in the Preston and Ribble Valley Out Door Feature. e-petition: Introduction of offence of vicarious liability for raptor persecution in England, the purpose of which is to bring those parties to justice. Wildlife Film: Students from Cardinal Newman College Preston have produced a short educational video on helping to protect the wild creatures of Preston. The baby tawny owl rescued from the middle of a Longridge road is to be hand-reared after attempts to find its parents have failed. Peregrine Falcons Saved After Fall From Church Nest. A stricken peregrine falcon which was rescued from a church roof has been returned safely to its nest. Larkholme Primary School Visit: It was nature red in tooth and claw at Larkholme Primary School, when the Turbary Woods Owl Rehabilitation Centre, Preston brought some of their birds to meet the KS1 and Reception classes. Goodbye Barny: We are sad to announce that Barny, our oldest living rescued barn owl, sadly passed away on the 23-01-2014. Bird of prey released back into the wild: An injured bird of prey has been released back into the wild after police worked with a bird sanctuary and local falconer to nurse it back to health. Preston Church Encourages Peregrine Falcon Watchers: St Walburge's Church in Preston has two falcons nesting on its tall spire. Turbary Sponsors Volunteer: Just writing to thank Turbary for it's contribution in sponsoring me to attend a National Youth Theatre of Great Britain course in London this summer. Church Plunge Falcons Saved From Predators. Two baby peregrine falcons had to be rescued and whisked away to a secret location after falling mid-flight at a Preston church. Pupils get wise to the world of owls: Pupils at Larkholme Primary School had an unforgettable experience when they were visited by guests from a bird sanctuary. Chernobyl Childrens Visit: Every year a group of children from Chernobyl visit Turbary Woods Owl and Bird of Prey Sanctuary in Lancashire.